Of the many creator-owned superhero properties that sprang from the 1992 advent of Image Comics, Spawn is without doubt the most influential. Conceived, written, and illustrated by Image co-founder Todd McFarlane—best known previously for writing and drawing Marvel Comics’ multiplatinum-selling Spider-Man series (19901991)—Spawn #1 (1992) begins the story of former U.S. Marine Corps soldier Al Simmons (a character named after one of McFarlane’s college friends), who progresses to a brilliant career as a covert intelligence operative after distinguishing himself by saving the president of the United States from an assassin’s bullet. Simmons subsequently discovers that his mentor and superior, Jason Wynn, is presiding over a web of international intrigue and corruption. Wynn protects his secrets by sending an operative named Chapel (a character from fellow Image partner Rob Liefeld’s Youngblood series) to murder Simmons by burning his face off with a laser. Simmons finds himself not only dead, but also doomed to an eternity in hell because of the many crimes he had committed as a covert government operative. But Simmons has never taken defeat well; at the precise moment of his death, he makes a deal with Malebolgia, the demonic overlord of a Dantean “eighth sphere of hell.” Thanks to this unholy bargain, Simmons gains the power to return to the world of the living, where he can see his beloved wife again; and, as the hellborn creature known as Spawn, he now has an opportunity to wreak vengeance on the man who engineered his death. 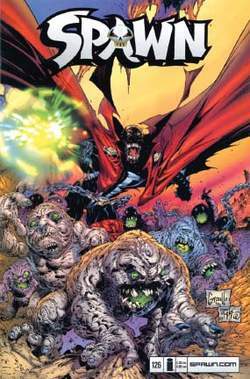 Spawn’s hell-haggled supernatural powers include teleportation, superhuman strength and endurance, and the ability to transform his facial features—left in horrific ruins by the laser Chapel used to kill him— on a temporary basis. Added to his skills as a trained killer, these new gifts make Simmons all but unstoppable in combat. Spawn’s resurrection wasn’t the first such occurrence in the annals of superhero comics. McFarlane’s demonic hero embroidered on such ectoplasmic predecessors as the Spectre (a powerful and vengeful shade who originated in DC Comics’ Golden Age [1938-1954]) and Deadman (who haunted DC’s Silver Age [1956-1969] Strange Adventures anthology title), by exploring the consequences that flow from bargains made with the forces of darkness. After agreeing to be transformed into Spawn, Simmons finds himself back on Earth—where he learns that five years has passed since his death, and discovers that he is free to use his powers to do battle against minions of hell and other evildoers. But he also finds that he is expected to command Malebolgia’s demon armies in a war against the forces of heaven. Even more painfully, he learns that his wife has remarried and is now raising a family with her new husband. Unwilling to cause his widow further grief by re-entering her life—and not wishing to frighten her by allowing her to see his horribly scarred visage—Spawn opts to live out his days in the world’s back alleys, among the dregs of humanity. Determined not to use his abilities to enhance the power of evil in the world, Spawn turns against Malebolgia, whom he sees as having betrayed the spirit of their bargain. Spawn subsequently commits himself to bringing the powerful demon down, while simultaneously trying to redeem himself for his prior misdeeds as a covert intelligence operative. Like Marvel’s Punisher and DC’s Batman, Spawn is separated from his family by forces beyond his control and responds to his trauma by waging an eternal one-man war against all the evil he encounters. Despite his good intentions and dogged determination, Spawn must also contend with some sharp constraints against the use of his preternatural abilities; his battle against hell is hampered by the fact that killing the bad guys he encounters merely sends more evil souls into Malebolgia’s employ, thus increasing the “evil quotient” of the universe. Also, every time he uses his abilities he places himself in danger of permanently returning himself to hell by depleting his finite supply of eldritch energy. On top of that, his cloak and some of the other pieces of his way-cool, heavy-metal costume are sentient, parasitic entities with agendas of their own. Simmons’ life is further complicated by the unwanted presence of the Violator, an evil, sadistic clown sent by Malebolgia to act as Spawn’s “chaperone” on Earth—a sort of “guardian demon,” who might have been conceived by a Satanic Frank Capra. Because the series combined the twin Zeitgeists of its time—a reliance on the “gritty” ultra-violence that became the lingua franca of many superhero comics of the late 1980s, and an emphasis on aesthetics that sometimes overshadowed its storytelling—Spawn became an immediate hit among comics readers, collectors, and speculators. Spawn’s appeal, which is strongest among teens and heavy metal enthusiasts, stems in no small part from his appearance, which is derivative of many of the superheroes (and rock bands) McFarlane grew up with. Spawn’s costume clearly shows the influence of Marvel’s Spider-Man, Doctor Strange, and the Punisher, along with liberal dollops of DC’s Batman and Lobo. Spawn’s visual appeal arguably transcends the milieu of the violent postmodern superhero; he wouldn’t look at all out of place playing rhythm guitar with such rock bands as KISS or Gwar. The unrelentingly grim tone of Spawn might have stalled the series creatively fairly early in its run, had McFarlane not decided to bring in some new blood. Fan favorite writer Alan Moore, who gained international prominence after penning DC’s seminal 1986-1987 Watchmen miniseries, wrote Spawn #8 (1993), and subsequent issues were authored by Neil Gaiman (best known for DC/Vertigo’s long-running Sandman series), Frank Miller (of Batman: The Dark Knight Returns fame), Dave Sim (creator and writer-artist of Cerebus the Aardvark), and Grant Morrison (DC’s Animal Man). Thanks in part to the efforts of these creators, Spawn’s mythos evolved significantly in sophistication and expanded to include such new personages as the Hellspawn (earlier incarnations of Malebolgia’s minions), Cogliostro (a powerful ally to Spawn, whose immortal nature and lengthy history are evocative of DC’s Phantom Stranger), an angel known as Angela, and an antagonist called the Anti-Spawn. As the 1990s progressed, not only did Spawn become a popular stop for talented guest writers, the character also guest-starred in such intercompany “crossover” comics as Batman-Spawn: War Devil and Spawn-Batman (both 1994 Image Comics/DC Comics co-productions). Spawn also engendered several comics spin-offs, including Spawn Blood Feud (four issues, 1995); Spawn: Blood and Salvation (a 1999 one-shot); Spawn: The Undead (1999–2000); and such long-running titles as Sam & Twitch (1999-present), about a pair of urban detectives investigating the supernatural in a Buffy the Vampire Slayer meets NYPD Blue setting; Spawn: The Dark Ages (1999–2001); and Hellspawn (2000-present), the latter two of which feature versions of Spawn (Malebolgia’s other demonic military commanders) that are even meaner than the original 1992 incarnation. Taking on a life of his own during his first half-decade of existence, Spawn also became the subject of a 1997 feature film, Spawn, starring Michael Jai and directed by Mark A. Z. Dippe. This gave rise to an Emmy Award-winning HBO animated series (1997–1999), and provided a major impetus to Todd McFarlane’s toy company (McFarlane Toys), which generated huge sales with its line of action figures based not only upon Spawn, but also on such licensed properties as KISS, Shrek, The X-Files, Austin Powers, Army of Darkness, Alien, Predator, and the Beatles. Comics, toys, films, and television series aside, the greatest contribution that Spawn—and McFarlane—have made to the superhero genre may be in encouraging comics creators either to retain ownership and control of their creations, or to obtain better payment for their work. Like artist Neal Adams, whose crusades in the late 1960s and early 1970s on behalf of creators’ rights pressured comics publishers to offer better terms to artists and writers than those found in the industry’s then-standard “work-for-hire” contracts, McFarlane exerted a similar influence on the publisher-creator dynamic during the 1990s and beyond; indeed, McFarlane was one of Marvel’s highest-paid creators while he was still writing and drawing Spider-Man. Whether McFarlane’s aesthetic effect on comics was equally salutary will no doubt be debated for many years to come, however. But for good or ill, Spawn’s “grittification” of the storytelling and design of many other superhero comics published over the past decade is undeniable, showing up clearly in such Image titles as Witchblade (1995), The Darkness (1996), Violent Messiahs (1997), and Rising Stars (1999). The darkness and otherworldly violence that characterize Spawn can also be seen in comics such as 30 Days of Night (Idea Design Works, 2002), by Steve Niles and Ben Templesmith (who collaborated earlier on McFarlane’s Hellspawn); in Criminal Macabre (also by Niles and Templesmith, from Dark Horse Comics, 2003); and The Authority (1999, DC/Wildstorm). Mycelium used for initiating mushroom propagation. The collection of eggs deposited by aquatic animals, such as fish. To produce or deposit eggs or discharge sperm; applied to aquatic animals. To create a child process in a multitasking operating system. E.g. Unix's fork system call or one of the spawn() library routines provided by most MS-DOS, Novell NetWare and OS/2 C compilers - spawnl(), spawnle(), etc. To launch another program from the current program. The child program is spawned from the parent program. In contrast, the subordinate male observed in Catoctin Creek used the tactics of a satellite to effectively steal spawns from the resident nest builder on three occasions. Therefore, in cases where fish populations spawn within a restricted period of a few hours, as occurs with some clupeid fish populations (Stratoudakis et al. All sea urchins that spawned engaged in it, but not all sea urchins that engaged in it were observed to spawn during the experimental period. It gets sexually mature at 18-24 cm length and spawns in natural and artificial environments in two seasons i. Repeated measures ANOVA was used to assess changes in duration of the incubation period and interspawning interval, egg quality (number of eggs per spawn, egg wet weight, volume, biochemical composition, and total energy content), and juvenile quality (number of JI per spawn; cephalothorax length and weight of JI and 30-d-old juveniles; survival, biochemical composition, and total energy content of 30-d-old juveniles) among successive spawns. PCA scores for observations of undeveloped and post spawn catostomids overlapped to a lesser extent than for the other reproductive condition categories but nevertheless overlapped for all but male white sucker (Fig. When salmon and sewin are taken before they spawn a whole generation can be wiped out, devastating future stocks. In this study, two variables (OUR, & pH) were measured to indirectly quantify the progression of spawn run. Hence, SPAWN instructs creek side property owners: "Woody debris, let it be. Fish tagged and recaptured during non-spawning season in Newport Bay may have represented fish that remained there year-round or migrated to spawn and returned in the winter. The osenkas run the river as the autumn leaves begin to drop, but they don't spawn.